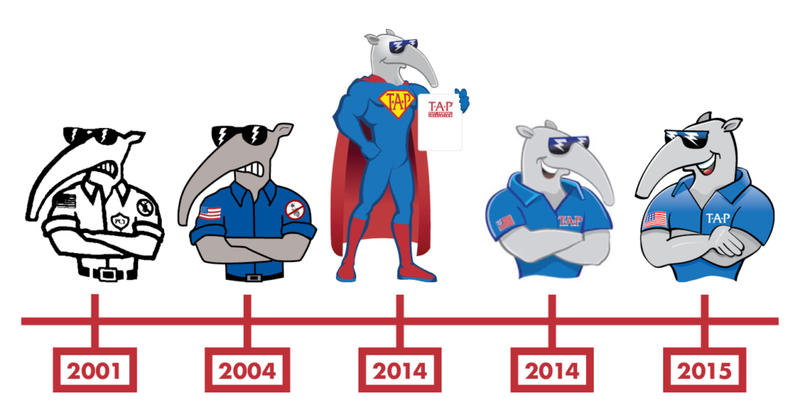 The iconic Tapper the anteater emerged from the creative genius of Bill Turk, CEO, and is the official mascot of TAP® Pest Control Insulation. Tapper made his first appearance on the first bag of TAP® Pest Control Insulation, which rolled off the line in 2001. A more detailed Tapper with the same iconic scowl and lightning bolt glasses was introduced in 2004. His blue shirt with an American flag patch, company name, and exterminator icon was designed to resemble a shirt that a Pest Control Operator would wear. In 2014, Super Tapper was created for advertising purposes. His new face proved popular, and a new Tapper was commissioned with a few minor edits: his scowl was changed to a smile and his blue shirt became a polo. In 2015, the Tapper you see today debuted. He is very similar to the previously commissioned Tapper with one small change: the original black outline of the first Tapper was brought back. Tapper has his clothes changed from time to time for various holidays and events but remains otherwise unchanged and continues to serve as the mascot of TAP® Pest Control Insulation. Want to learn more about Tapper? Read more here!